And on the 11th day of May the heavens parted, the sun came out, the temperature rose, and there was much rejoicing. And knocking on wood. And throwing salt over shoulders. And going for long walks in search of spring! 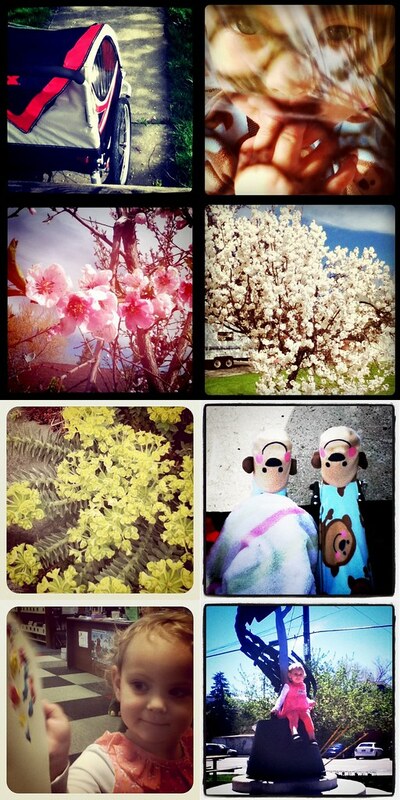 Here's a glimpse of the perfect spring day that Z-cakes and I had yesterday. :: We got a stroller/bike trailer last week. I am completely in love. The last stroller I pushed Z in was an umbrella stroller. :: Z patiently waited to get going on our "nature walk." It was so nice outside she didn't want the cover on the stroller. :: We spotted lots of beautiful trees. :: And one that had popcorn growing on it! :: And the plant that my dad refers to as "the eyeball plant." :: And monkeys! Z-cakes didn't want to get dressed when I was ready to go for a walk and I didn't feel like making her. So: monkeys. :: After our walk we went to the library where Z painted a "river." Because that is what she paints/draws. I swear someday when she is an artist she will have a collection named "River." There will be no paintings of anything resembling a river. :: FINALLY, Z-cakes got to play on the statue outside the library for as long as she wanted while I read a book. She calls this statue "the talking one." As far as I can tell the statue has nothing to to with talking but what do I know? I hope you get a chance to get out and find spring today. And don't forget to bring your camera. It's the 12th! It sneaks up on you, I know. It was GORGEOUS yesterday and is supposed to be even more so today. Holy crap I'm excited. Thanks for the 12th reminder. I almost spaced it. That would have been tragic. Sounds like we are one day behind you. Today is our fabulous, gorgeous spring day we have been waiting for! So happy. I love the idea of Z having a collection of River artworks, none of which bear any obvious resemblance to a river. It's been spring here for weeks and I still haven't appreciated it much- I'm mostly an indoor recreator. Low-level, as Denise would say.